STATEN ISLAND (WABC) -- A Staten Island man says his close encounter with a deer became too close for comfort. 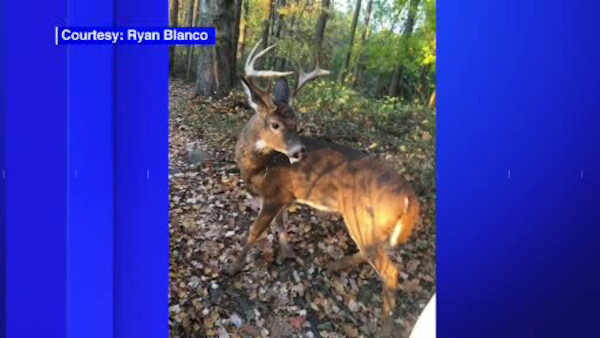 Ryan Blanco says he was hiking in the Staten Island Greenbelr last month when a young buck took a liking to him. Blanco took the opportunity to snap some selfies with his new friend. But when he was ready to move on, the situation changed drastically. "When he blocked my path, he put his head down and got into a battle position," said Blanco. "When he came up to me I grabbed onto his antlers because he had already charged against my legs. And all I did was push with all my might, hoping it wouldn't escalate at that point and I'm just glad that I'm here to tell the story." Blanco was not hurt. City parks officials discourage interacting with animals.